Hooked on Cycling Holidays is a team of cycling tour specialists with a passion for cycling, travel, and discovering amazing destinations around the world to include on the tours we plan for our fellow cycling enthusiasts. We have a variety of self-guided and guided biking vacations in Croatia to offer cyclists of all experience levels, so if you’re looking for the cycling adventure of a lifetime, you’ve come to the right place. Our cycling holidays include self-guided bike tours and guided bike and boat tours, and we’ve developed a wide variety of exciting cycling tours for you to select from. You also have quite a few options with regard to where you stay, so it’s safe to say that you won’t be limited in any way with regard to shaping your cycling holiday to your individual requirements. So what do you hope to see and experience on one of our exciting self-guided or guided cycling holidays in Croatia? If you expect to see the remote mountainous regions away from the developed coastline you’re in luck, or if you hope to visit the southern area of Dalmatia and the strikingly beautiful island of Korcula that can also be arranged, as can the cultural experience that is Pula, the stunning capital of Istria. The coastline of Croatia is spectacular with hundreds of islands providing fantastic daily rides that are sure to offer something for everyone. And as you will be staying on a boat, or as our guests often like to say, a ‘floating hotel’, it means that this type of trip is ideal for cyclists and non-cyclists alike, since on the days that you don’t wish to cycle you can choose to relax on board and soak up the gorgeous Croatian sun. Please take a look at the Croatian cycling holidays that we have to offer you below. 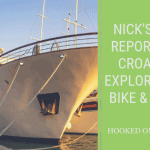 The aim of this information is to provide you with an informed understanding of what our cycling tours have to offer, the things you will experience and see on one of our cycling tours of Croatia, the places of interest that you will visit on your tour, along with our latest tariffs, what each tour includes, and the available optional extras. Our detailed itineraries also outline the routes taken, the lodging options, the distances between each destination on the tour and how to get there and away, and everything else that you need to make an informed decision about our cycling holidays in Croatia. And if you require further information about any of our tours, please don’t hesitate to get in touch with Hooked on Cycling. Explore the coastal region between Trieste and Pula. The start of this biking vacation is Trieste and After a few kilometres you leave Italy and cycle to Croatia and on to Istria. Discover three national parks on this biking vacation in Croatia. You will also get the chance to see The Plitvice Lakes and the spectacular waterfalls.